The second and final set in the Amonkhet block, Hour of Devastation, continues the story of the Egyptian style desert plane. But this time it’s the end of the world. 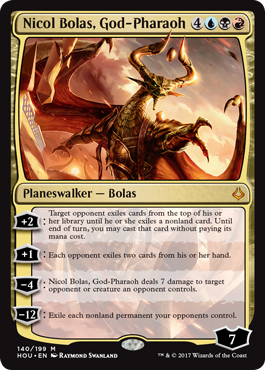 The legendary Nicol Bolas marks his promised return on Amonkhet, and he has devastating abilities to match. The plot of Magic the Gathering will advance in Hour of Devestation as the Gatewatch planeswalkers confront one of the game’s most famous and powerful adversaries: the dragon planeswalker Nicol Bolas, who has unleashed utter destruction on Amonkhet’s city-state of Naktamun. The Hour of Devastation set, like other recent sets, has five “story spotlight” cards, as well as other lore-centric cards, and all of them point to a grim turn of events. Here, the heroic Gatewatch characters are finding themselves overwhelmed by Nicol Bolas’ vast power as Naktamun falls to the dragon’s Eternal minions. The five “story spotlight” cards in Hour of Devastation are among several cards in this upcoming set, all being mono-colored rare instants and sorceries with awesome power. Hour of Revelation, for example, depicts Nicol Bolas’ re-emergence onto Amonkhet, and the card’s game effect is an upgraded version to an older, popular card: Planar Cleansing. The other four cards continue the story of Nicol Bolas devastating Naktamun, including the onslaught of three new God cards. The five “Last” cards show the desperation of Naktamun’s defenders against Nicol Bolas’s army of Eternals, willing to trade an untap step for immediate, undercosted power. The Amonkhet set had five mono-colored Gods, and Hour of Devastation‘s three new Gods are a new twist on the concept. They are two-colored (excluding green and white mana), and rather than having indestructible, they can be returned to their owner’s hand upon death. All three also have powerful activated and triggered abilities that play off of each other. The Scorpion God, for example, allows its controller to pay mana to put a -1/-1 counter on a creature, and whenever a creature with a -1/-1 counter on it dies, The Scorpion God allows its controller to draw a card. Other mechanics and themes from Amonkhet also return with new twists in Hour of Devastation. The Embalm ability, common to white and blue creatures in Amonkhet, is replaced with Eternalize. A creature with Eternalize exiles itself from the graveyard and returns in token form, similar to Embalm, except an Eternalized creature is a black zombie and always has power/toughness 4/4. Many cards in Hour of Devastation gain extra power by having certain types of cards in your graveyard or creatures having -1/-1 counters on them, echoing Amonkhet. For example, Grisly Survivor, a common black creature, gets +2/+0 whenever its controller cycles or discards a card. 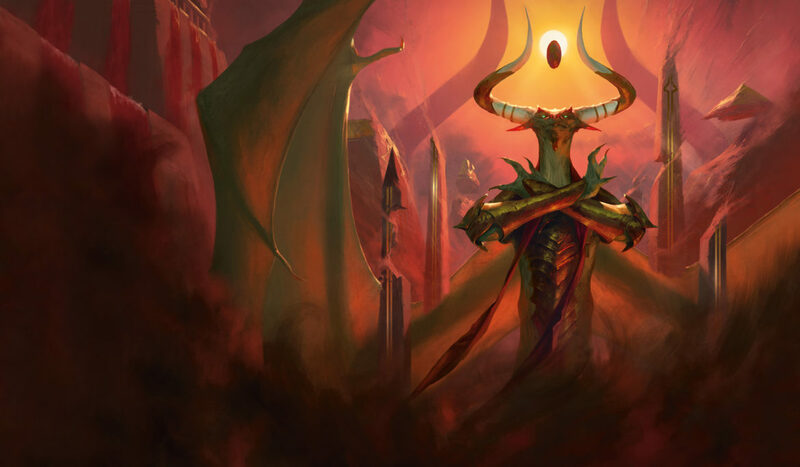 Overall, Hour of Devastation is set to bring an exciting, chaotic conclusion to the story of Amonkhet, not the least because it marks the long-awaited return of Nicol Bolas. The set releases July 14.